The objective of this research is to determine the competitiveness level of the manufacturing small and medium-sized enterprises (SMEs) of Baja California and to identify which areas within them affect this competitiveness. The methodology used is descriptive, correlational, and cross-sectional; the systemic competitiveness model is developed at the micro level, and a measurement instrument with 64 questions is used on 195 companies in the state; in addition, traditional multiple linear regressions are performed to test the hypotheses. One of the findings is that the SMEs in the state have a medium-low competitiveness level and do not show any relationship between the size of the companies and their competitiveness; however, the production-operations area prove to be more important for their competitiveness level. Although the measurement instrument that is used has no proportionality at the municipality and subsector level, it does allow us to approach the internal operation of the SMEs. The study of competitiveness has become an increasingly significant line of research, not only among academics but also among organizations. Its importance lies in the fact that it can be analyzed from different perspectives and each of these contributes to revealing a part of the competitiveness generated in an organization. There are many definitions of competitiveness, from an enterprise level to a country level. One of the most important and complex is systemic competitiveness, which analyzes, from a macroeconomic level, economic development policies and social and cultural factors, from an enterprise level to an industrial level. Additionally, manufacturing small and medium-sized enterprises (SMEs) in the country and particularly in the region of Baja California, Mexico─formed by five municipalities: Ensenada, Mexicali, Playas de Rosarito, Tecate, and Tijuana─are the basis of the industrial network of the state because these generate a significant portion of formal employment and contribute to economic growth. Because it is a border state, Baja California is characterized by its industrial vocation, with aerospace, electronics, metal-mechanical, automotive, and medical supply industries standing out. For this reason, the manufacturing industry contributes 54% of the gross domestic product (GDP) of the industrial sector, with machinery and equipment standing out. Therefore, having a competitive manufacturing industry will make it possible to further strengthen its contribution to the GDP of the state and generate more employment and wealth in both the state and the country. The manufacturing sector in the state is said to be competitive, which raises the following question: how competitive is it? Furthermore, what areas within a company contribute to its competitiveness is also unknown. The first objective of this research is to determine the competitiveness level at the enterprise or micro level of the manufacturing SMEs of Baja California. The second objective is to determine which areas within these companies influence this competitiveness level the most; to that end, hypotheses are proposed for each area, and an additional hypothesis of the existence of a positive relationship between the size of the company and its competitiveness level is also proposed. To achieve these objectives and to answer these questions, a measurement instrument is developed using the eight dimensions collected in the systemic competitiveness model of the Inter-American Development Bank (IDB) at the enterprise level; this instrument is applied to companies from all manufacturing subsectors of the state. The analysis of the results is divided into two parts; the first part is a descriptive analysis that allows the competitiveness level of the manufacturing SMEs to be established. The second part of the analysis is inferential and uses traditional multiple linear regressions to find positive relationships among the eight dimensions or areas within a company that contribute to business competitiveness. The contribution of this research to the state of the art is that, by having greater knowledge of the internal operation of SMEs in the sector, these will take actions to reduce certain weaknesses that are under their control and increase their efficiency, their productivity, and, therefore, their competitiveness. After acknowledging that competitiveness is systemic, the different areas in which a company operates─micro, macro, meta, and meso─must be analyzed; however, this study focuses on the micro level because it is the only level in which employers have direct influence and control. This study is divided into four sections. The first section covers the contextual framework of manufacturing SMEs in Baja California and examines competitiveness, concepts, and implications from the international level to the enterprise level. Certainly, everything concerning systemic competitiveness and the various studies in this field conducted in the country are also analyzed. The second section explains the methodology used to achieve the objective of this research. In the third section, a data analysis is conducted, and the results that make it possible to respond to the proposed objectives and hypotheses are discussed. Finally, a series of conclusions and lines of research that can arise from the present research are addressed. SMEs are the dominant organizations in all of the countries of the continent. They represent more than 95% of existing businesses globally and have certain competitive advantages over large companies due to their smaller size and ease of adaptation to changes in the economy and demand patterns (Gonzalez, 2013). In addition to being dominant, SMEs are an essential part of job creation in all countries─because most jobs are generated due to them─and of contributing to economic growth (Vázquez & Arredondo, 2014). According to the National Institute of Statistics and Geography (Instituto Nacional de Estadística y Geografía [Inegi], 2009), companies in Mexico are classified according to the number of workers employed; in the case of small industrial companies, the number of employees varies between 11 and 50 and, in medium-sized companies, from 51 to 250 workers. According to ProMéxico (2013, par. 1), SMEs are the backbone of the national economy due to commercial agreements signed in recent years and due to their high impact on job creation and domestic production. According to the Inegi (2014a), there are approximately 4 015 000 business units in Mexico, of which 99.8% are micro, small and medium-sized enterprises (MSMEs), and they generate 52% of GDP and 72% of the employment. Consequently, SMEs have become a major source of employment in the country. Additionally, manufacturing SMEs are responsible for 50% of Mexican exports in this segment. Of the 2 500 million dollars in products from SMEs that the country exported during 2011, half corresponded to companies that produce manufactured goods for the domestic market and for export (Rosagel, 2012). There are approximately 250 000 SMEs in the country, and among them, the manufacturers stand out. Within the total number of SMEs in the country, the services sector is the most representative, with 157 153 business entities; within the industrial sector, a total of 29 835 companies were identified, representing nearly 12% of the total business entities of the country within this group. This same ratio is maintained in Baja California, where 1 004 out of the 8 709 business entities in the entire state are manufacturing SMEs (Inegi, 2014a). In a disaggregated analysis by number of SMEs in Baja California, according to the Inegi, Tijuana has 52.49% of the manufacturing SMEs, with a total of 527. Following Mexicali (226) and Ensenada (149), marginally, is the rest of the state, with only 10%. Regarding manufacturing subsectors, the companies that stand out in the state are those in the segments of food, beverages, and tobacco (180), machinery and equipment (174), and the basic metal industry and metal products (136). This trend is observed in the municipalities of Tijuana, Mexicali, and Tecate; meanwhile, the textile industry predominates in Ensenada, followed by the food industry. Data from the Inegi (2014b) show that in Baja California, the industrial sector in 2013 accounted for 35.18% of the GDP of the state, with a total of $134 931 000 pesos, of which $73 726 000 corresponded to the manufacturing industry (54.6% of the industrial GDP). Within this industry, the machinery and equipment subsector contributes the most, with 41%, followed by the food, beverages, and tobacco industry and other industries. These data show the industrial specialization of the state due to its strong industries, mainly aerospace, medical, and electronic products, in which it even stands out internationally (Investinbaja, n.d.; Oxford Business Group, 2014). Currently the concept of competitiveness has acquired a major presence in the literature, both internationally and at the local level, after analyzing the economic progress of both countries and companies. International comparisons make it possible to determine which countries─through their companies─have delivered improvements to citizens by increasing their quality of life. Therefore, it is recognized that the international competitiveness of a country is closely related to highly productive companies that make the most of the competitive advantages that the country generates through its institutions, policies, infrastructure, and culture. The term competitiveness does not have a specific definition. There is a lack of consensus for conceptually defining it due to the extent of its meaning, which may cover the enterprise, sector, national, and supranational levels; also, due to the qualitative and quantitative nature of its factors, it lacks precise limits in the level of analysis and the different measurement methodologies. A single definition of this concept does not exist; therefore, a series of definitions appear that broaden its sense and meaning from various perspectives. For the World Economic Forum (2010, p. 4), competitiveness is “the set of institutions, policies, and factors that determine the level of productivity of a country”. An increase in productivity increases the level of income of a country and simultaneously achieves prosperity for citizens through an improvement in their quality of life. [a]innovation as a major constituent element of economic development; [b]the innovation capacity of an industrial organization, outside Taylorist theories, to develop its own learning abilities; and [c]the role of collaborative networks, dedicated to innovation and supported by various institutions, to build innovation capabilities (Hernández, 2001, p. 15). Similarly, Labarca (2007, p 161) interprets competitiveness as the “opportunity of citizens to reach a high and rising standard of living that is determined by the productivity from the use of national resources and the output per unit of labor or capital used”. In addition, competitiveness is achieved “by attaining higher productivity in existing business or by successfully venturing into higher productivity businesses (Labarca, 2007, p. 161). This definition is more in line with the approach of the World Economic Forum (2010) and with the ideas of Porter (1991), in which the productivity and quality of life variables are essential in the equation. business competitiveness derives from the competitive advantage that a company has through its production and organization methods (reflected in the price and final product quality) in relation to those of its competitors in a specific market. A company’s feasibility of reaching and maintaining its competitiveness level is concentrated in the distinctive competences or competitive advantages that it develops internally and in the external constraints from both the industry or sector it belongs to and the region-country where it is located (Cabrera-Martínez, López-López, & Ramirez, 2011, p. 25). Is agreeable in the sense that enterprise success lies in the organizational capacity to anticipate and react to market demands, and consequently, a key factor of such success is flexibility, understood as the ability of the employer to quickly adapt to the changes demanded by the market. Create systemic competitiveness, which is based on three pillars: [a]developing innovation systems to accelerate the accumulation of technological capacity, [b] supporting the diversification and creation of production chains, and [c] providing quality infrastructure services. She also establishes that, in the environment of the company, the competitiveness level is affected, directly or indirectly, by a large number of combined factors, such as the level of education, infrastructure, product market sophistication, corporate culture, efficiency of the institutions, and the environment, to name a few. The successful management of production flows and of raw materials and component inventories. The successful integration of market planning, research and development activities (R&D), design, engineering, and manufacturing; the innovation process is one of the main pillars for sustaining competitiveness, and economic development, patents, and other forms of industrial and intellectual property protection play a crucial role in economic growth. The ability to combine internal R&D with R&D performed in universities, research centers, and other companies. The ability to incorporate changes in demand and the evolution of markets as well as the creation of an environment that is favorable to business are an important factor for economic prosperity, competitiveness, and growth. The promotion of productive programs using schemes that facilitate greater integration and partnerships between companies as well as the establishment of schemes that allow the development of suppliers and distributors within the value chain. Berumen (2006) groups the determinants of the competitiveness of the company into two types. The first type consists of determinants related to prices and costs, whereas the second type consists of those related to product quality, the incorporation of technological improvements in processes, “the efficient management of production flows, and the ability to develop and maintain relationships with other companies” (Cabrera-Martínez et al., 2011, p. 24), the vital capacity to generate research, development, and innovation (R+D+I) processes, among others. The interest in adopting comprehensive schemes that make it possible to understand and encourage a dynamic development of the aspects that impact competitiveness has increased in the Latin American region. For this reason, countries such as Brazil and Mexico have adopted the systemic competitiveness model according to a specific approach, after considering the particularities of each sector through differentiated weighting and giving greater importance to aspects that are considered strategic. Esser, Hillebrand, Messner, and Meyer-Stamer (1996, p. 40) analyze the concept of systemic competitiveness and establish a frame of reference for both industrialized and developing countries that is premised on “social integration, demanding economic reforms and a project of social transformation” (Messner cited in Saavedra & Milla, 2012, p. 21). Their study stands out for including “four different analytical levels (meta, macro, meso, and micro)” (Messner, 1996, par. 39). The factors studied in the meso level include the capacity of a society in terms of integration and strategy as well as consensus with the “market and world market orientation” (Esser et al, 1996, p. 42). The meso-level examines the formation of an environment that is capable of promoting, complementing, and multiplying efforts at a company level, such as the fusion of the elements that are part of the industrial economy, the theory of innovation, and industrial sociology. The macro level refers to the stabilization of the macroeconomic context based on the reforms of fiscal and budgetary policies as well as the monetary and exchange rate policies (Messner, 1996, par. 39). competitiveness is measured by the quality of life achieved and its improvement, the level and growth of aggregate productivity, and the ability of domestic companies to increase their penetration into world markets through exports or direct foreign investment. In this regard, Suñol (2006) claims that the success of internationally competitive companies is preceded by prolonged macroeconomic stability in the country of origin, which in turn creates a competitive macroeconomic environment due to “the availability of physical, natural, institutional, and human resources” (Suñol, 2006, p. 196), by being well managed in the long term, these resources are catalysts under which companies can compete globally. At the microeconomic level, there has been a continuous improvement of companies and chains of production; this has produced positive externalities […] and has created an environment in which companies develop four factors that are necessary to achieve competitiveness: cost efficiency, quality, variety of products, and responsiveness; to achieve such an environment, there have been changes […] made to production organization, product development, and value chain organization (Gracia, 2006, p. 41). Competitiveness does not arise when the macro context is modified, nor it is created exclusively with entrepreneurship at the micro level. Competitiveness results […] from a pattern of complex and dynamic interaction between the state, businesses, intermediary institutions, and the organizational capacity of a society. [In] terms of a systemic approach, business competitiveness depends on the interaction between micro-level elements and those of the meso, macro, and meta levels. It is also necessary that companies are able to reach a high level of productivity, quality, flexibility, and agility, which enables them to sustain a strategic competitive advantage and to generate enterprise networks to accelerate the processes of collective learning (Saavedra & Milla, 2012, p. 28). Additionally, the success of an organization partly lies in the strategies and policies that support its competitiveness, which must be used frequently; it is also essential to make improvements to processes and innovations to stay ahead of the competition in the sector to which the organization belongs. All of these types of actions will contribute to the competitiveness level of the company (Aragón & Rubio, 2005; Berumen, 2006; Estrada, García, & Sánchez, 2009). Source: Own elaboration using data from various authors. • Strategic planning: This dimension relates to whether organizations have objectives and term goals, policies for their achievement, and follow-up. It considers whether studies on environmental threats and contingency plans have been conducted. In theory, this dimension should be fully applied to all companies because it supports their reason for being and doing; however, evidence shows that sometimes this dimension is not considered a priority that would make a company more competitive (Aragón, Rubio, Serna, & Chablé, 2010; Castellanos, Gálvez, Montoya, Lagos, & Montoya, 2006; Du & Banwo, 2015; Estrada et al., 2009; Rosto, 2010). • Production and operations: The importance of this dimension regarding the competitiveness of the company lies in the complexity of the production processes, the use of modern tools of production, certifications, flexibility in production processes, raw materials and supplies planning, new product development, and inventory management, among other factors. These factors allow companies to react in the short term to changes in demand patterns and in factors that are external to the organization; therefore, the greater the flexibility and modernization of processes and operations are, the greater the competitiveness of the company (Du & Banwo, 2015; Medina & Naranjo, 2014; Saavedra & Tapia, 2011; Zevallos, 2003). • Quality assurance: in this dimension, the level of implementation of quality standards, quality work groups, certifications, and programs to address contingencies is determined. Evidence indicates that companies in which quality processes and product quality are certified and have higher levels of competitiveness (Aragón et al., 2010; Flores & González, 2009). • Marketing: This dimension consists of the analysis of sales policies, distribution channels, forms of payment, relationships with customers and suppliers, the definition of the target market, and market studies, using marketing strategies and customer satisfaction. This is one of the most relevant dimensions because the interaction with customers and suppliers is essential for efficiently producing and distributing as well as successfully selling products to customers (Aragón & Rubio, 2005; Flores & González, 2009; Martínez, Palos, León, & Ramos, 2013; Zevallos, 2003). • Accounting and finance: A study is conducted to determine whether companies have defined their cost structure, profit margin, financial planning and management, tax strategies, tax payments, etc. A large part of the success or failure of organizations is related to having access to financing and the strategies for making proper and intelligent use of the economic resources of the organizations (Aragón & Rubio, 2005; Saavedra & Tapia, 2011; Zevallos, 2003). • Human resources: Part of the competitiveness of an organization is related to the proper use of human resources. It is key to have a rigorous process of selection and recruitment, education and training programs, analysis of the causes of labor turnover, the work environment, and programs that address them, compensation systems, and compliance with safety and industrial hygiene aspects (Aragón et al., 2010; Aragón & Rubio, 2005; Flores & González, 2009; Martínez et al., 2013). • Environmental management: The new requirements in this area are more relevant for consumers. Companies must be competitive and simultaneously responsible with the environment. 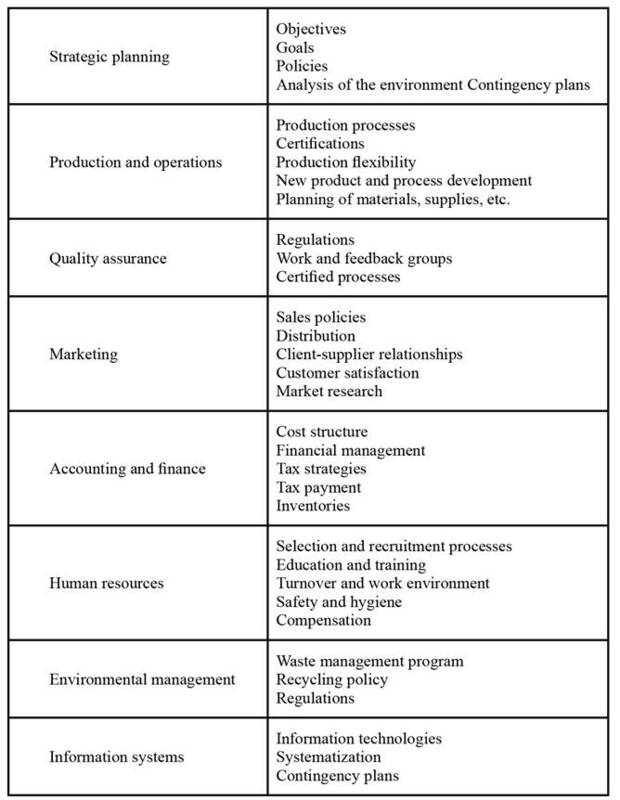 A competitive company analyzes the use of environmental standards, creates programs in that field, and has waste management policies and a recycling policy, among other measures (Castellanos et al., 2006). • Information systems: There is ample evidence of the importance of technology as a mechanism of business competitiveness. Organizations that are conscious and adopt information and communication technologies, that are staffed with specialized personnel, that have a certain degree of systematization, and that create contingency plans are more likely to become more competitive not only nationally but also internationally (Aragón et al., 2010; Aragón & Rubio, 2005; Cuevas-Vargas, Aguilera, González, & Servín, 2015; Estrada et al., 2009; Flores & González, 2009; Ibarra, González, & Cervantes, 2014; Zevallos, 2003). According to the literature above, it is to be expected that better strategic planning, a suitable environmental management system, the adoption of information systems, and the efficient management of human resources, among other factors, will result in a better ability to take measures to promote competitiveness in companies. The eight dimensions described above cover a variety of routine and systemic activities performed in companies. For this reason, these activities are considered sufficient for conducting the business competitiveness analysis of the manufacturing SMEs of Baja California. Under this structure of analysis, all areas of the companies are equally considered, which generates results that describe the performance of each area and its contribution to the overall competitiveness of the company. In addition, the extensive literature generated to date supports the need to integrate all aspects of a company to avoid creating biases between areas and activities that affect the actual results of the competitiveness analyses conducted. In Mexico, a number of empirical studies have been conducted in the last decade to assess the competitiveness level of companies, particularly MSMEs, which, as noted above, are the main generators of employment in the country; therefore, reviewing previous studies, this section intends to identify which areas or dimensions within companies contribute the most to their competitiveness. In this manner, the results obtained make it possible to identify points of agreement with the study conducted on the manufacturing SMEs of Baja California and to find explanations for the analysis in question. From a systemic approach at the micro level, the study by Aragon et al. (2010) stands out because it establishes that the main elements of competitiveness of the MSMEs of Tabasco are the implementation of technological resources, innovation, product quality, and human resources. Additionally, it is found that companies with an export profile tend to have a higher competitiveness level. In this regard, Aragón and Rubio (2005) confirm the elements of financial capacity, technologies, innovation, marketing, and human resources as the explanatory factors of the competitive success of SMEs in the state of Veracruz. After analyzing the SMEs of Morelia, Flores and González (2009) determine that competitiveness is mainly associated with external relations factors and product quality whereas the human resources and technology factors have less influence. Martínez, Palos, León, and Ramos (2013) indicate that the most important factors for the competitiveness of SMEs in San Luis Potosi are marketing, human capital, cost policies, and the relationship with suppliers. Similarly, the same is indicated in the studies by Vázquez, Guerrero, and Núñez (2014) for the states of Aguascalientes and Colima, Jalisco, and Queretaro, for whom the information technologies factor stands out. Moreover, the factors of strategic planning, innovation of products, processes, and management, and technology present a positive correlation with regard to the competitive success of SMEs in the state of Hidalgo (Estrada et al., 2009). 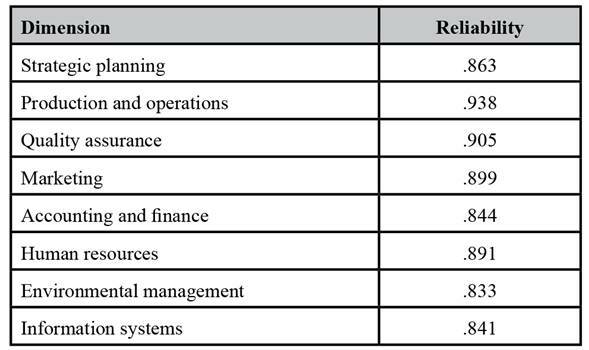 Additionally, Red PYMES-Cumex (2010) concludes that within the small businesses in the states of Hidalgo, Mexico, Puebla, and Sonora, the most problematic elements are administrative planning, human resources, and information technologies usage; however, the financial aspect is the top ranked. According to Rosto (2010), the lack of strategic market planning as well as the administrative model of owners or managers hamper the competitiveness of companies in Mexico. In the case of the municipalities of Torreon, Frontera, and Monclova Coahuila, the operational and marketing aspect of companies is the most problematic for their survival, whereas in the phase of consolidation, the financial aspect is the factor that gains the greatest importance (Molina, Armenteros, Medina, Barquero, & Espinoza, 2011). 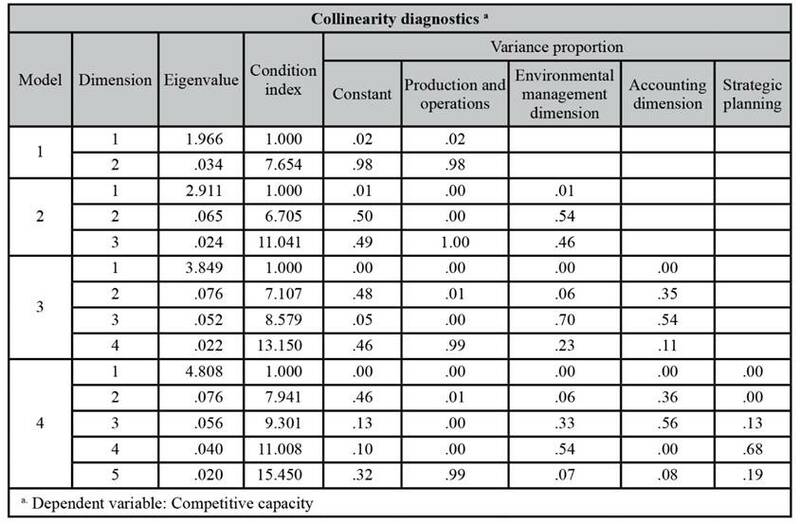 In addition, the investigation by Saavedra and Milla (2012) on the micro-level competitiveness of MSMEs in the state of Queretaro shows that, in the eight dimensions, the competitiveness level of industrial companies is low; however, the chemical and the plastic and rubber industry subsectors, as well as the basic metal industry, stand out; in contrast, the food industry is the least competitive. Therefore, it can be observed how technological aspects, innovation, product quality, human capital, and marketing play a crucial role in the competitiveness level and success of companies in this country. H1: Strategic planning has an impact on business competitiveness. H2: Production and operations activities have an impact on the competitiveness of SMEs. H3: Quality assurance allows SMEs to be competitive. H4: Marketing activities directly affect business competitiveness. H5: Accounting and finance activities affect business competitiveness. H6: Human resource management is associated with the level of business competitiveness. H7: The dimension of environmental management has an impact on the competitiveness of SMEs. H8: Implementing information systems enables the competitiveness of enterprises. H9: The size of the company is related to its competitiveness level. The first objective of this research is to determine the level of business competitiveness or the “micro-level" competitiveness of the manufacturing SMEs of Baja California. To that end, a non-experimental-quantitative, descriptive, and cross-sectional study was conducted based on the eight dimensions of business competitiveness of the competitiveness map of the IBD. A measurement instrument consisting of 64 questions (6 for strategic planning, 13 for production and operations, 6 for quality assurance, 12 for marketing, 7 for accounting and finance, 8 for human resources, 5 for environmental management, and 7 for information systems) was designed and structured in a Likert scale using five options ranging from “never/is not done/not available” to “always/is done/available”. Once all of the answers were coded by question, the average scores for each question were established; subsequently, the same procedure was performed to obtain one result per dimension and then a general result; these results were placed in one of the five levels of competitiveness: 1=very low, 2=low, 3=medium, 4=high, 5=very high. With these levels, it was possible to describe the results obtained from the instrument, as indicated by Flores and González (2009) and Moyano, Puig, and Bruque (2008). In the second stage of the research, a traditional multiple regression analysis was conducted with the objective of finding which of the dimensions analyzed tends to have more influence on the competitiveness of companies. To that end, the “competitiveness of the company” was selected as the dependent variable; it consists of questions concerning the “competitive situation over the rest of the sector”, the “frequency in the use of competitive strategies”, and the “incorporation of innovation and improvements across the company”. To build this variable, the same procedure described above was used, which made it possible to find the overall competitiveness value of the company measured on a scale from 1 to 5─very low to very high. In addition, the eight dimensions of the study, quantified in the Likert scale as noted above, were incorporated as independent variables. Similarly, the variable of company size was incorporated as a control variable to determine whether the size of companies has an impact on their competitiveness level. This variable is dichotomous, with 0=small and 1=medium. To conduct the surveys in the manufacturing SMEs of the state, the following parameters were identified in the determination of the sample (see Table 2). Due to information access issues, 195 enterprises were surveyed, which was roughly equivalent to 80% of the sample. The surveys were conducted between November 2014 and February 2015; the owners or managers of companies were visited and interviewed to obtain the results. In some cases (27 cases), the human resources manager or the production manager was interviewed; in these cases, there could be some biases in certain dimensions due to the level of knowledge of their area that these managers had. Another limitation present in certain moments was the quickness of the answers due to the interviewee’s lack of time; therefore, atypical answers and extreme cases were analyzed and subsequently eliminated to obtain the highest level of normality of the answers. Additionally, the instrument was validated by performing Cronbach's alpha reliability testing; the overall result was very satisfactory, at a level of .98, and the analysis by dimension provided the following equally satisfactory results (Table 3). Out of all of the companies surveyed, 41.7% were from the municipality of Tijuana, 27% from Mexicali, 25% from Ensenada, and 6.3% from Tecate. The municipality of Playas de Rosarito was integrated into the municipality of Tijuana. Additionally, 56% of the companies surveyed were classified as small-sized. The most represented subsector in the sample was food, beverages, and tobacco products (25%), followed by the subsector of other industries (22%), metal industries (13%), machinery and equipment (10%), and textiles, clothing, and leather industries (10%); the remaining subsectors together accounted for 20%. It is acknowledged that there is no proportionality in the number of companies surveyed by subsector and municipality due to the limitations imposed by the companies that accepted participation in the study. However, the results are sufficiently reliable to allow the proposed objective to be achieved. The results from the study of the business competitiveness of the manufacturing SMEs of Baja California indicate that these companies can be divided into two competitiveness levels consisting of the companies that have a “medium” level (48%) the companies (40%) that are considered to have a “low” level. Very few companies show high or very high levels of competitiveness; this finding indicates the existence of large areas of opportunity for improving this important sector for the state’s economy (see Table 4). All dimensions have low levels of competitiveness; however, it increases with the accounting and finance dimension, as in the results of Saavedra and Tapia (2011). This finding suggests that companies do not have established comprehensive for determining costs or have a financial plan that is rigorous enough to make decisions in the short, medium, and long term in regard to costs, profitability, investment, and the introduction of new products, among others. In fact, within this dimension, the questions related to the costs factor and the use of financial information are evaluated with low levels, which indicates that the companies significantly lack its application. Source: Own elaboration based on results from the survey conducted. Other dimensions such as quality assurance and human resources also have low competitiveness levels. In the first case, the reason may be that companies give this factor less importance due to a lack of competitors or because it is not considered a priority. In the second case, a lack of specialized personnel in various areas is observed, in addition to a low level of training and schooling as well as a lack of appropriate programs for the selection of human capital. Questions related to recruitment and selection and the work environment have the worst reviews by the companies. In this regard, Estrada, Garcia, and Sánchez (2009) find that these two dimensions are not related to the competitive success of SMEs in the state of Hidalgo. It can also be observed that even with a low overall competitiveness level, the dimension of strategic planning has 21% for a high competitiveness level. These data suggest that a particular group of companies continuously works on strategic planning and communicates to employees the objectives, goals, strategies, and actions of the company to continue growing. In addition, these are companies that are at least 5 years old, which shows that their strategic planning is effectively applied with a certain degree of importance. Regarding the dimension of production and operations, almost half of the companies have a medium competitiveness level; this result suggests that the companies consider that using materials and human resources to create products contributes to value generation for their customers. The results obtained reveal that most of these companies perform sales forecasts on which they base their production and know its status and progress. The competitiveness levels by company size are similar between the levels described above, though in the case of medium-sized companies, practically the same number is found in both levels; in contrast, 52% of the small-sized companies have a medium competitiveness level compared to the 36% that have a low competitiveness level. Furthermore, at the subsector level, the competitiveness level of the food, beverages, and tobacco subsector is low, with 50%, and medium, with 44%. This case is almost the same for the oil and carbon-derived products and the plastics and rubber industries subsectors as well as for other industries. The manufacture of furniture and related products subsector shows a medium level, with 55%; the textile industries, clothing, and leather industries subsector as well as the paper, printing, and related industries subsector have a medium competitiveness level of between 74% and 71%, respectively. Regarding the metal industries, 12% have high competitiveness levels, though almost half of the companies are in the medium level, which is a situation that is similar to that of the machinery and equipment subsector. A not very representative case─due to the limited number of companies registered in the state─is the wood industry, which is considered highly competitive. Finally, in the non-metallic mineral products subsector, 60% of these firms have a medium competitiveness level. With the aim of understanding their characteristics, the most important results of the surveys at the municipality level are presented below. Mexicali: This municipality is characterized by having medium-sized companies of a low competitiveness level (54%), though a smaller group (30%) that has very high competitiveness levels stands out. In the case of small companies, 41% are in the low competitiveness level, whereas 46% are in the medium level. In general, in all subsectors, there is a fluctuation between the low and medium competitiveness level, though it tends more toward low. The machinery and equipment subsector stands out; 66% of these companies are in the low competitiveness level, and the rest are at a very high level. In six of the eight dimensions, the ratio between companies with a low and medium competitiveness level is maintained; however, in the dimension of accounting and finance, 50% have a low level. A similar situation is observed in the dimension of environmental management. Tijuana: The proportion of medium-sized companies that have a low and medium competitiveness level is the same (46% each), whereas 56% of the small companies are in the medium level. The subsector of food products, beverages, and tobacco and other manufacturing industries stand out as not very competitive. Regarding the wood industry and the non-metallic mineral products subsector, their competitiveness level is slightly high, whereas the other subsectors are in an intermediate position. The dimensions of human resources, marketing, production and operations, and information systems have a medium competitiveness level. The dimension of accounting and finance has the same behavior as in the municipality of Mexicali. Ensenada: Both small and medium companies have medium and low competitiveness levels. Only two subsectors─textiles, clothing, and leather industries and paper, printing, and related industries─have a medium level. For the remaining sub-sectors, the level is low. The dimensions of environmental management, accounting and finance, human resources, and quality assurance have low competitiveness levels; the remaining dimensions maintain a medium-low trend. Tecate: Most SMEs have medium competitiveness levels, unlike the rest of the municipalities, where there is segmentation between the low and medium levels; here, there is uniformity in the competitiveness levels. The analysis by subsectors shows that the competitiveness level is also considered medium. As in the previous data, six of the eight dimensions have a medium level; of these dimensions, strategic planning is considered to be the most competitive and accounting and finance the least competitive. Although several dimensions in the overall results have low competitiveness levels, the data clearly show how it is the dimension of accounting and finance that has concerning elements because it has the lowest level for all municipalities of the state, regardless of company size. In this second part of results, the most interesting aspects of the different dimensions as well as their indicators that were part of the research are analyzed. 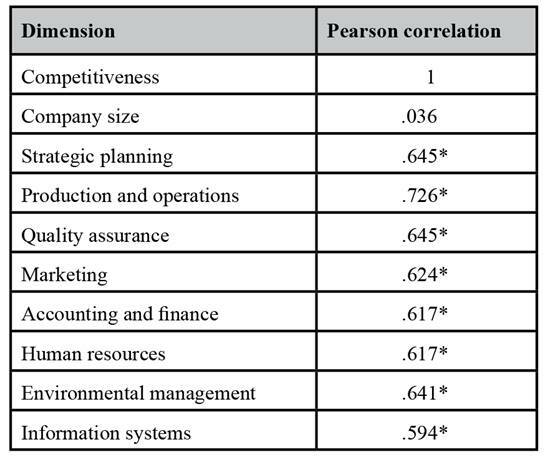 In a first approximation, the results of the Pearson correlation coefficient applied to the eight dimensions (independent variables) related to the competitiveness of the company (dependent variable) are shown; also, the control variable (company size) is introduced in the analysis. 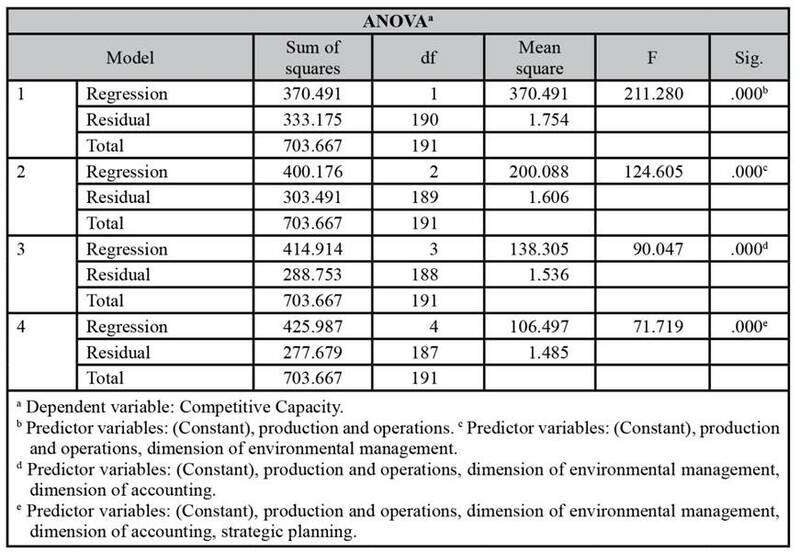 The results (Table 5) show how the dimensions of production and operations, strategic planning, and quality assurance have a greater level of correlation with regard to the competitiveness variable. Note: *Correlation significant at the 0.01 level (bilateral). However, to test the hypotheses proposed, we constructed a multiple regression model that seeks to generate more information than that provided by the analysis of correlations. Seeking greater robustness in the analysis, first, the type of relationship between the variables was analyzed using a scatter diagram; it was found that there is a linear relationship, which is an essential assumption to use the ordinary least squares method. Subsequently, a regression analysis through the stepwise method was run, based on which it was possible to determine that of the eight independent variables introduced in the analysis, only four better explain the dependent variable, thus ensuring that there is no collinearity of the independent variables and finding the collinearity statistics (such as the coefficients of determination, tolerance, and variance inflation factor-VIF) within the accepted parameters (see tables 6 and 7). Additionally, Belsley (1991) notes that a condition index of up to 10 indicates a weak level of collinearity and a moderate level if it is above 30; in this case, the index was 15.45, which confirms that there is no collinearity, as noted above. Once the regression was performed, the remainders were graphed to contrast the assumption of normality of the remainders and the assumption of homoscedasticity. Thus, model 4 (4 of 4) best explains the relationship between variables, with an adjusted R square of .597 and a standard error of the estimate of 1.219; additionally, the Durbin-Watson test result of 1.619 proves that there is no autocorrelation or independence of the remainders; the level of significance was .007 (see tables 8 and 9). 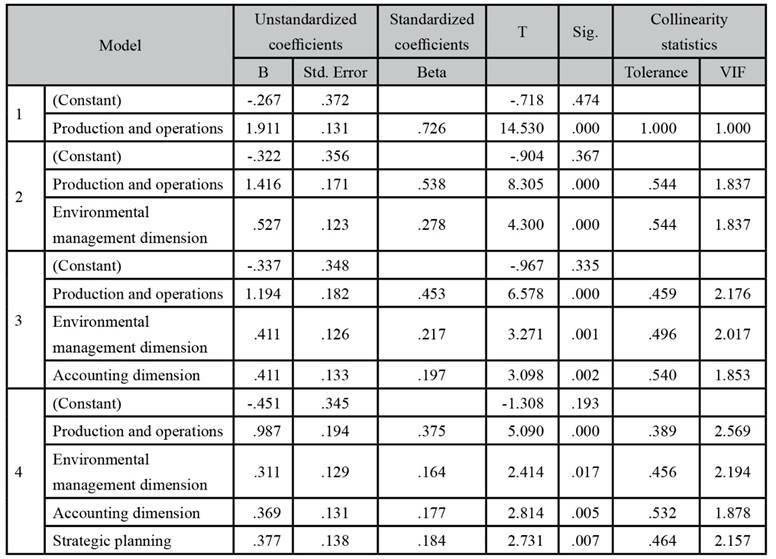 Table 10 shows that the dimensions that most impact the competitiveness of the manufacturing SMEs of Baja California are production and operations-which is partly consistent with the results of Estrada et al. (2009)-and, to a lesser extent, strategic planning, accounting and finance, and environmental management-Flores and González (2009); Red PYMES-Cumex (2010). As a result of these analyzes, hypotheses H2, H1, H5, and H7 are accepted, though the latter with a low level of acceptance. However, hypotheses H3, H4, H6, and H8 should be rejected, even though there is theoretical evidence that supports them, particularly in the domain of information systems. In the case of the quality assurance dimension, a possible explanation for understand this information entails the fact that SMEs in Mexico, unlike in other countries, have not yet developed a broad culture of quality in their products and processes. In the case of information systems, the most reasonable explanation is the lack of penetration of these systems in SMEs on the basis that access to information and communication technologies is still limited and the current access is for basic use (Ibarra et al., 2014). In the case of the dimension of marketing, the incipient utilization of information systems and the traditional use of distribution channels can be a limiting factor for its expansion and innovation; the reason is that presently, the use of digital platforms and electronic commerce is an important mechanism for marketing products more widely and efficiently. Finally, in the dimension of human resources, labor turnover, the work environment, and the lack of training, there could be problems that affect the proper use of human resources in the organizations. Additionally, the results show how the control variable of “company size” is not significant and therefore is not one of the variables selected by the model-it was discarded in the second model (2 of 4); accordingly, it is concluded that there is no relationship between the size of the company and its competitiveness, and therefore, hypothesis 9 is rejected. Studies on systemic competitiveness are important because these make it possible to understand how the development of an organization is affected by its exogenous and endogenous factors. The specific case of competitiveness at the micro or enterprise level leads to a specific understanding of the activities performed by companies in different areas. This type of competitiveness can be considered the most important because the company itself has direct control over the variables that enable its development and strengthening in the market. The results obtained indicate that manufacturing SMEs in Baja California are moderately competitive but show a significant downward trend, regardless of their size. All of the analyzed dimensions have medium and low competitiveness levels, which is the same situation as in the subsectors analyzed. Some of the dimensions directly impact the competitiveness of companies, as noted in the multiple regression analysis performed. The descriptive results show that the area of accounting and finance is considered less when running a business, and employers do not have the vision to use this area as a starting point to ensure that the competitiveness of the company increases. However, the regression analysis performed shows how this dimension has a significant impact on the competitiveness of companies, which corroborates the idea that, when this area is not prioritized, companies neglect a significant part of their own growth and consolidation. Furthermore, the dimension of production and operations best explains the competitiveness of companies. These results generate important information about the situation of the manufacturing sector in Baja California regarding competitiveness; in addition, the results may be used for comparison with other research conducted in the region that produces similar results in terms of competitiveness level. Therefore, it is important to continue producing this type of research to understand, at the micro level, the weaknesses of the Mexican production apparatus and thereby develop public and industrial policies aimed to the growth and development of those involved. Additionally, the results help understand how companies do not consider the contribution of each area, which degenerates into areas that are over-supported in human, financial, and managerial terms, whereas others are considered secondary and therefore lack the necessary resources. As indicated above, the lack of proportionality in the surveys conducted, by municipalities and at the subsector level, is a limitation in this research, and consequently, the results obtained must be considered with caution. Additionally, with these results, other lines of research at the micro level can be opened, and each of the dimensions can be considered in a disaggregated manner to find actions or decisions that have been implemented incorrectly or that have not been implemented that may be key to improving competitiveness. ☆Manuel Alejandro Ibarra Cisneros. Mexican, PhD in Industrial Economics and Labor Relations from the Universidad de Castilla La Mancha, Spain. Degree in International Business from the Universidad Autónoma de Baja California. Assigned to the Postgraduate and Research Coordination of the Facultad de Ciencias Administrativas, UABC. Research lines: Adminstration and organization development. Book Coordinator: Estudio de las organizaciones: visión de las ciencias administrativas (2016), editorial ILCSA-UABC, and Estudios interdisciplinarios en las ciencias económico-administrativas (2016), UABC. ☆ ☆Lourdes Alicia González Torres. Mexican. PhD in Economics, Master in Economics and Degree of Economics by the Universidad Autónoma de Baja California. Research lines: Administration and Organization development. Recent publications: “El impacto de las TIC´S en las PYMES de la industria manufacturera de Baja California a nivel de subsectores”, Región y Sociedad. ☆ ☆ ☆María del Rosario Demuner Flores. Mexican. PhD in Economic and Administrative Sciences, Master in Administration and Public Accountant by Universidad Autónoma del Estado de México. Director of RECAI Revista de Estudios en Contaduría, Administración e Informática. Research lines: human capital, structural capital and relational capital, strategic management and intelectual capital. Recent publications: “Alternativas de gestión del capital estructural en las instituciones de educación superior. Una propuesta de evaluación”, Cuadernos de Administración, 32(55), 2016 and the book TI en la dinámica del conocimiento empresarial, 2015.